VTT voltage (or IMC voltage): While there's no specific "uncore" voltage for Lynnfield like with LGA1366 Core i7 CPUs, the VTT (or IMC as Asus call it) voltage helps with baseclock overclocking. Reports vary on exactly how much voltage needs to be applied, but usually we've seen that a 200MHz base clock will require 1.35-1.4V depending on the motherboard and CPU. Above 200MHz anything up to 1.45-1.5V can be needed on air, but again the story is the same as the CPU voltage on danger and cooling. "Light" overclocking will often require no change. Once you've found your happy frequency, drop this voltage until you lose stability then sit it just above it. 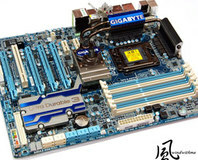 CPU PLL Voltage: At first we assumed this required heavy overvolting like Core 2 products, applying over 2V, however the unanimous reply from Taiwanese engineers was that very little extra voltage is needed - if any. At any base clock 200MHz and over we typically applied 1.9V. PCH Voltage: The PCH is the P55 chipset, and as a glorified southbridge it requires very little, if any, additional voltage. 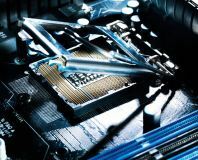 Given the fact it's cooling is often limited and it sits under hot graphics cards, adding more voltage and heat will create just as much problems as it attempts to solve. Change this as a last option. DRAM Voltage: As with the LGA1366 CPUs, a maximum 0.5V difference between CPU uncore voltage and memory is advised. Since there's no specific "uncore" voltage now (don't mistake CPU core voltage with the uncore that contains L3 cache, the memory controller and now PCI-Express controller), it does limit the extra voltage that can be applied to the memory and 1.65V is still the norm for most performance modules. We have run 1.8V for short periods of benchmarking to push our memory further, which the CPUs will handle fine, but we don't recommend long term use over the recommended settings. DRAM Reference Voltage: This memory specific option can be left on Auto for 99 per cent of people, unless you're heavily tweaking and pushing the DDR3 memory bus (for which, you need high performance memory plugged into it). We've hit 2.35GHz without adjusting these values, however we know 3GHz is do-able with some Lynnfield boards. 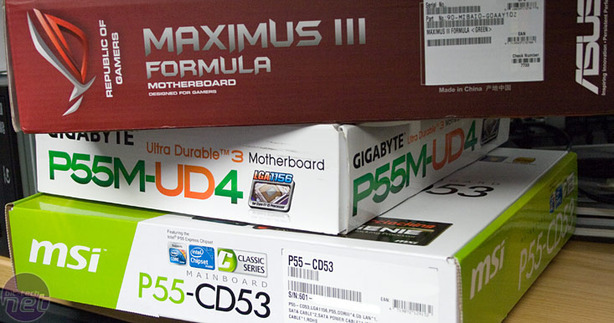 If you are interested in these values, our advice is to check with professional overclocking forums for tips. CPU Clock Skew: Again, this can be left to auto, however if you are on the verge of stability at a high clock this factor can sometimes help where voltage cannot. The downside is that it's a completely blind art - unless you have an oscilloscope to SEE the clock generated, there's no way to easily tell how much skew to add to the clock to keep it all aligned. Short of spending a lot of time continually testing scenarios where you find the instability on each option, there's no easy way to narrow down the best setting. If one of the clocks is then changed, this process needs to be started again. Hardware Prefetecher/Cache Prefetechers: Leave these ON! They will improve performance. Virtualisation Technology: Unless you're using virtualised environments (an OS within an OS like XP Mode within Windows 7), this can be disabled. ACPI 2.0 Support or HPET (High Performance Event Timer): Enable this/these. BIOS Profile Saving: Each motherboard designer will have a different brand for this function, but ultimately all it does is save the current applied settings to a profile file which can later be re-enabled after a CMOS reset. Flashing the BIOS with an updated version will most likely lose these or invalidate these saved settings though. The better BIOS' will allow profile naming and multiple slots for ease of use, and even more ingenious ones will offer the end user the ability to load a profile after a CMOS reset has been done (MSI and Gigabyte). Our advice is to absolutely use this feature, just like you'd save any important document. Nothing is more annoying than having to start again, struggling to remember what every setting was. Turn off anything you don't use! If you don't use Firewire, the floppy port, serial and parallel ports or extra SATA ports: turn them OFF! It saves system resources, reduces potential conflicts and power/clock dependencies on heavily loaded buses. In BIOS Flash Utilities: USE THEM. They are generally more reliable than using Windows and far, far more convenient than digging out a floppy drive or making a bootable USB stick. It's incredibly important to reset the CPU back to its default settings because potential instability from elevated frequencies only increase the risk of flash corruption and failure! 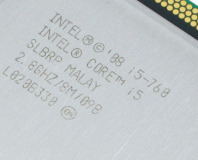 Intel finally gets around to updating the brilliant i5-750. Let's hope that hasn't broken it. Will Intel's first mid-range unlocked CPU set the market on fire?